Private 235419 1st Bn. Leicestershire Reg. No photograph. Can you help? 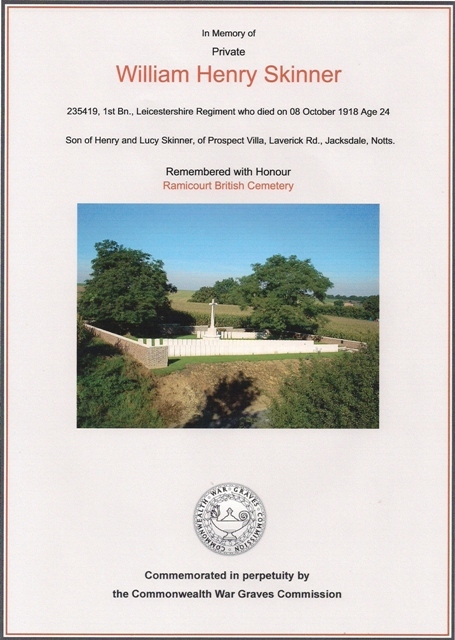 Private James William Henry Skinner was the son of Henry & Lucy Skinner of Prospect Villa, Laverick Road, Jacksdale, Notts. In 1901 the family are boarding with William Bentley. At that time, James is aged 7 and his brother Samuel was aged 6 months. J. W. H. Skinner also appears on the ‘Absent Voters List of 1918’ as living on Palmerston Street, Old Westwood, serving in B Co.1st/6th Bn. Leicestershires. His parents later moved to Prospect Villa, Laverick Road, Jacksdale. James is mentioned on his parents’ grave in St Mary’s Churchyard as their ‘beloved son’ who was ‘called to higher service’. 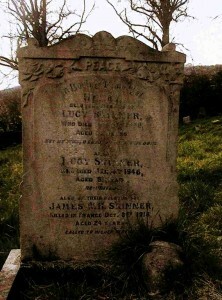 His Mother, Lucy, died on the 4th January 1946 aged 81. James enlisted at Eastwood, date unknown. He was originally Pte. 34874 of the Sherwood Foresters, transferring to the Leicestershire Regiment. This was probably due to his Battalion being depleted and then absorbed to make up the shortfall in the Leicestershire Regiment. Private Skinner was killed in action on Tuesday 8th October 1918, age 24. 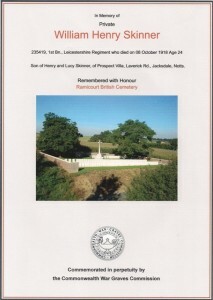 He is buried at Ramicourt British Cemetery, Aisne, France, being one of 108 World War One Casualties buried there. He was awarded the British War and Victory Medals. In July 1921 his personal effects amounting to £23 12s 10d were paid to his mother Lucy and this included a £15 war gratuity. We would very much like to hear from any living relatives who may be able to furnish us with further details and perhaps even a photograph.